We have plenty of stock ready to view whether you are a charity, school or private individual with a requirement for your family. Indeed, whatever your organisation, we can help you find the right used 9 seat minibus for your needs. And the great advantage of choosing Minibus World to supply your used 9 seater minibus is that if you can't find something that meets your needs exactly we can probably help with this. 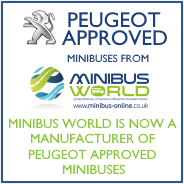 We're not only minibus experts but we're also minibus converters and manufacturers. If we can't source the right 9 seater minibus for you chances are we can modify something that's already in stock or we have plenty of low mileage used vans in that we can use as a platform to build something to match your exact requirements, giving you a used 9 seat minibus with a brand new conversion inside! We also supply new 9 seater minibuses and 9 seat wheelchair accessible minibuses, and if you can't find the right vehicle for you here follow the link to see all our 9 seater minibuses for sale. Why not pick up the phone to discuss your requirements? Please call a member of our friendly Sales Team on 01782 444 289.